On Tuesday, Dec. 6th, the United States Supreme Court began to decide if schools that ban recruiters from their campuses can lose federal funds. 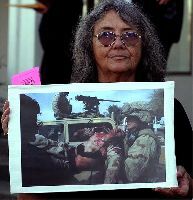 There were protests and actions at military recruitment stations all across the nation. The Santa Cruz Chapter of the Buddhist Peace Fellowship has created a scroll with 28,000 names in Arabic of Iraqi civilians who have died in the war. This is one of the most conservative of the reported numbers of Iraqi civilian deaths. 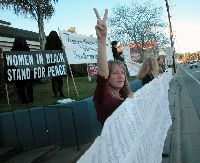 As part of the nationwide day of action, the scroll was displayed at the military recruitment center on 41st Avenue in Capitola along with other signs and banners opposing the continued war in Iraq and the daily loss of Iraqi and American lives. The scroll is three feet high and over one hundred feet long. In front of the Military Recruiting Center on 41st Avenue in Capitola, over 50 activists gathered on Friday Nov 18th to call for an end to the Iraq war, and to bring our troops home now. Spreading out along a whole block of 41st Avenue, participants carried signs, banners, and flags, and flashed the peace symbol to the passers-by! The day was called National Stand Down Day because "stand down" is a term used by the military for days when they have training, reviews etc., and so "stand down" from their normal duties. Thus, citizens all over the country "stood down" for an hour or two from their normal duties to help bring this war and occupation to an end! "Not one more death, not one more dollar for war!" Join concerned citizens in cities across the US in a public candlelight vigil to mark the loss of the 2,000th US soldier in Iraq. 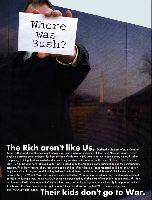 Two thousand is too many, and we call upon the Bush Administration and all our elected officials to pull our men and women immediately out of this needless war. We call for an end to all death and injury, American and Iraqi alike. We call for an end to the occupation now! And we call for a return of the resources of Iraq to the Iraqi people. On the evening after the 2,000th death, come together at 7:00 PM at the Town Clock Park in the city of Santa Cruz (at the corner of Mission/Water Streets and Pacific Ave). Bring candles to hold shielded from the wind - and bring flowers, ribbons, shells, feathers, photos, poems, votive candles, and.... to create an altar in honor and in memory of those slain and injured. If you can, wear Black or White. After the vigil we will march in a "trail of tears" down Pacific Avenue and up to Mission Park (by Holy Cross Church), the site of the original occupation and genocide on the land that we, here in Santa Cruz County, now inhabit, a thread that pervades our nation and lives on exponentially into Afghanistan and Iraq. 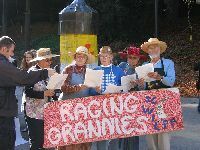 Information about community vigils and more can be found on the AFSC's list of over 604 local vigils all over the US. In bizzarre irony, a Vietnam war resister was arrested and has been imprisoned since August. 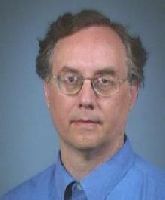 Jerry Texiero, age sixty-five, is in ailing health and has lost thirty pound since his imprisonment. Meanwhile, AWOL Air National Guard member George W. Bush continues to terrorize the world as a free man. News has surfaced that Texiero will be released with a discharge, rather than putting him on trial. We need to speak out in defense of this man and any others who bravely dare to speak out against bogus wars.